Think wine is the best thing about the Barossa Valley? Wrong! The best thing about the Barossa Valley is Maggie Beer. The cook, restauranteur, cookbook author and maker of fine foods is one of South Australia's best exports. 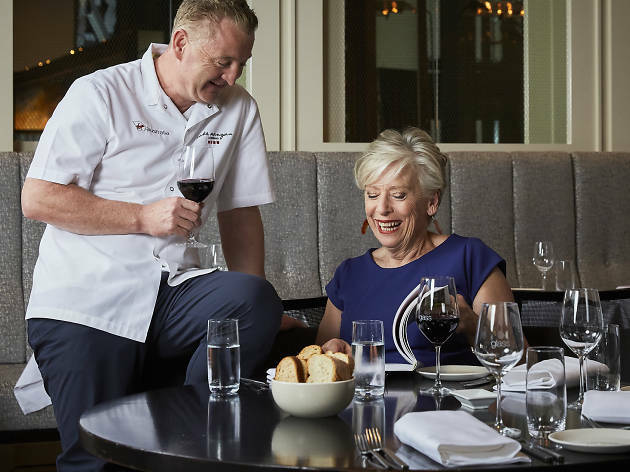 But if a trip to the Barossa isn't on the cards for you never fear because Maggie Beer is teaming up with Luke Mangan to create a new winter menu at the Hilton Sydney. Visit Glass Brasserie on level two at the Hilton Sydney this winter to try Beer and Mangan's latest culinary creations. Drawing from the fresh, quality produce of both New South Wales and South Australia, the collaborative menu is just the thing for a dreary winter's day. The duo has come up with four dishes in total, comprising of three mains and a dessert. Warm up with chicken breast stuffed with mustard pear and served with crushed parsnip and jus. Love your pork? So do Beer and Mangan, creating a Seville marmalade-glazed pork belly with potato purée, cavolo nero and one of Beer's absolute favourite ingredients, verjuice. For those not in the know, verjuice is made from unfermented grape juice. Vegetarians won't miss out either with a delicious dish of cumin-roasted sweet potato, black barley, tahini and Persian feta. And if you'd prefer to skip straight to dessert we won't judge because Beer and Mangan have created a simple, stylish and most importantly tasty verjuice custard with bergamot-braised raisins. Hungry yet? The dishes are all part of the $29 Wine Bar Lunch menu which includes a main and a drink. 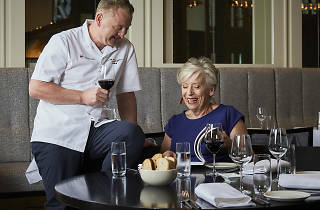 The new winter dishes from Maggie Beer are available at Glass Brasserie until August 31, so don't miss your chance to taste her cooking outside of SA.